The Very Best Of Jake Thackray. Title:The Very Best Of Jake Thackray. Your item will be previously owned but still in great condition. The disc will play perfectly without interruption and the case, inlay notes and sleeve may show limited signs of wear. 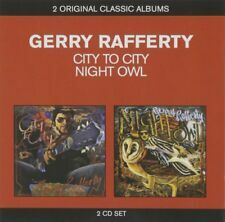 GERRY RAFFERTY. CITY TO CITY / NIGHT OWL. TWO ORIGINAL CLASSIC ALBUMS. CD ONE (CITY TO CITY). Family Tree. City To City. Whatever's Written In Your Heart. It's Gonna Be A Long Night. We are dedicated to providing you with a high quality service and product. All CDs are fully inspected by us and are play tested where necessary. Artist Various Artists Title Now Thats What I Call Music! 31 Label: EMI Records Number of Discs 2. Pink Floyd - Dark Side of the Moon. Title:Pink Floyd - Dark Side of the Moon. Artist:Pink Floyd. All of our paper waste is recycled within the UK and turned into corrugated cardboard. Your item will be previously owned but still in great condition. Iron Maiden - Edward The Great - Greatest Hits. Title:Iron Maiden - Edward The Great - Greatest Hits. Artist:Iron Maiden. Your item will be previously owned but still in great condition. The disc will play perfectly without interruption and the case, inlay notes and sleeve may show limited signs of wear. Various Artists - A Taste Of Two Tone. Title:Various Artists - A Taste Of Two Tone. Artist:Various Artists. Can't find what you're looking for?. We all like the idea of saving a bit of cash, so when we found out how many good quality used products are out there - we just had to let you know! Various Artists - Now That's What I Call Music! Title:Various Artists - Now That's What I Call Music! Artist:Various Artists. Your item will be previously owned but still in great condition. The disc will play perfectly without interruption and the case, inlay notes and sleeve may show limited signs of wear. David Bowie : The Best of David Bowie: 1969-1974 CD (1997)Title: The Best of David Bowie: 1969-1974 Artist: David Bowie Genre: Rock/Pop|Rock Duration: 77.40 mins Format: CD / Album Type: CD No. of Discs: 1 disc(s) Studio / Label: EMI Music UK UK Release Date: 27 Oct 1997. Various Artists - Now That's What I Call Christmas . Title:Various Artists - Now That's What I Call Christmas . Artist:Various Artists. Can't find what you're looking for?. Your item will be previously owned but still in great condition. Various Artists : I Grew Up in the 60s CD (2012)Title: I Grew Up in the 60s Artist: Various Artists Genre: Rock/Pop|60s Format: CD / Album Type: CD No. of Discs: 3 disc(s) Studio / Label: EMI TV UK Release Date: 26 Nov 2012. Various - Now That's What I Call Music! Title:Various - Now That's What I Call Music! All of our paper waste is recycled within the UK and turned into corrugated cardboard. Your item will be previously owned but still in great condition. Various - Now That's What I Call Music! Title:Various - Now That's What I Call Music! Your item will be previously owned but still in great condition. The disc will play perfectly without interruption and the case, inlay notes and sleeve may show limited signs of wear. Various - Now That's What I Call Music 29. Title:Various - Now That's What I Call Music 29. All of our paper waste is recycled within the UK and turned into corrugated cardboard. Your item will be previously owned but still in great condition. Various Artists - MTV Fresh 2 CD Album. Excellent condition disc, plastic case (but has hairline crack) and booklet; card slip case very slight shelf wear. Double CD of Pink Floyd UMMAGUMMA. Heartbeat [3CD Box set]. Title:Heartbeat [3CD Box set]. Your item will be previously owned but still in great condition. The disc will play perfectly without interruption and the case, inlay notes and sleeve may show limited signs of wear. RELEASED IN 2003 BY "EMI RECORDS", THIS IS THE "DEEP PURPLE" CD ALBUM RELEASE TITLED "BANANAS". EXCELLENT CONDITION CD. MORE CD by Pink Floyd, soundtrack album. Single CD album by Pink Floyd. Soundtrack of the film More. David Bowie - Stage (Live/Remastered, 2005). Condition is Very Good. Dispatched with Royal Mail 1st Class Large Letter. 1 Atomic 3:50. 20 Atomic '98 (Xenomania Mix) 4:33. 14 War Child 4:00. 2 Heart Of Glass 4:11. 5 The Tide Is High 3:52. 11 Island Of Lost Souls 3:50. 6 Denis 2:18. 13 Union City Blue 3:18. Marillion - Made Again (Live) (double,CD 1996). Condition is Very Good. Heaven 17 - Luxury Gap Deluxe Edition (2012) - 3 x CD Set. Condition is New. Dispatched with Royal Mail 1st Class Large Letter. The Cramps - Off The Bone. Condition is Very Good. Dispatched with Royal Mail 1st Class Large Letter. Of Discs: 1 disc(s) Studio / Label: EMI Music UK UK Release Date: 20 Sep 2004. 1 1 Thats Life (2004 Digital Remaster). 1 2 The Wife (2004 Digital Remaster). 1 4 Driving Test (2004 Digital Remaster). 1 5 Gas (2004 Digital Remaster). Iron Maiden - A Real Live Dead One 2CD Enhanced CD. Condition is Very Good. Dispatched with Royal Mail 2nd Class Large Letter. The Stranglers : The Collection CD (1997)Title: The Collection Artist: The Stranglers Genre: Rock/Pop|Punk/New Wave Duration: 59.40 mins Format: CD / Album Type: CD No. of Discs: 1 disc(s) Studio / Label: EMI Gold UK Release Date: 14 Apr 1997. Format: CD. Rare Collectables. Sale Corner. Classic Artists. It Hurts So Bad. Graded near mint condition a nice addition to the collection. Iron Maiden-The Number of the Beast,1998,enhanced,Tracks;ivaders/children of tghe damned/the prisoner/22 acacia avenue/the number of the beast/run to the hills/gangland/total eclipse/hollowed be thy name.............special multimedia section;run to the hills/the nature of the beast cd. Condition is Very Good. BUZZCOCKS - THE COMPLETE SINGLES ANTHOLOGY. THIS DOUBLE JEWEK CASE, BOOKLET AND DISCS ARE ALL GRADED AS VG . Now That's What I Call Music 35. Discs as New - Near Mint Condition. Inner tray complete as New. Owned Since New - Great Condition.